The theme for this ATC was Brrrrrr! What shows that more than snow LOL. I had this cute pair of gloved hands holding a snowball and I just got these adorable winter stickers from Oriental Trading Co. that happened to have one that said Brrr! So I paired them up! I used a piece of watercolor paper cut to atc size and used my Seascape ink Pad to brush across it a bit to soften it up. Then layered the gloved hands with the snowball on the top, cutting the edges to keep it the correct size. 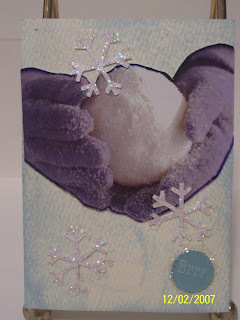 I added some snowflakes that I had cut out using my cuttlebug die. They wouldn't stay stuck on the paper so I used my Stickles to add a little sparkle and shine and to help keep them adhered to the atc top. I put the Brrr sticker onto a piece of light blue cs scrap I found laying around and then adhered it to the lower right hand corner of the atc, again using stickles around the edges to make sure it stayed there. This was another pretty simple idea that came together well. I was pleased with the outcome - hope you enjoy it too!